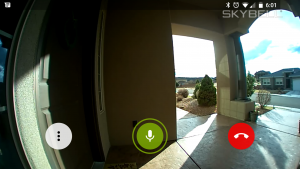 We have been playing with the SkyBell HD video doorbell for a few days now and we are very are impressed. The SkyBell HD is a smart doorbell with a lifetime theft guarantee that boasts 1080p video and 180 degrees of view. It provides instant phone and/or tablet notifications not only when the button is pressed but also when it detects motion. At that point you can choose to initiate a live video stream with 2-way audio, allowing you to talk with with the person at your door from your phone. 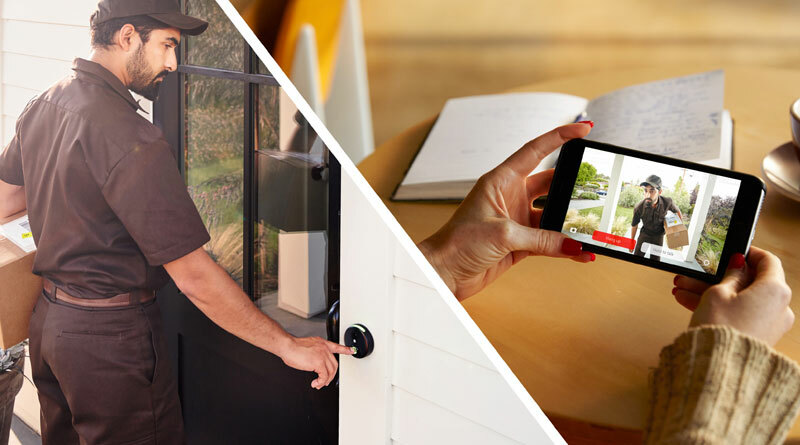 SkyBell also gives you the handy option of on-demand turning off your doorbell chime entirely, essentially providing a do-not-disturb mode for your home. We could imagine this could be especially helpful if you have sleeping baby in the house, work graveyards, or are just on vacation, etc.. Installation was fairly easy. The SkyBell connects to your current doorbell wiring, so all you have to do its mount it and connect the two low voltage wires. Provided in the Skybell package is a mini screwdriver, drill bit, screws, and anchors. Our particular installation was into stucco and we found that the provided bit it really too big in diameter for the provided anchors to properly hold. To solve this problem, we ended up using longer screws that went through the stucco into the backing plywood which seems to hold much better anyway. But we caution others where this might not be an option. The SkyBell also comes with an optional 45 degree mounting plate for installations where your doorbell is perpendicular to the door. This is a very nice addition that is not included with competing devices. The software setup was a bit more of a bumpy road. We first attempted to use a Pixel XL in order to assign the SkyBell to our account. After multiple tries, we kept getting a “connection failure” message on the last step where your home wireless password is transferred to the device. We decided to then try the setup on a Lenovo tablet and it worked on the first go around. Hopefully this was just a temporary bug that will be fixed in future updates to the Android app. Our overall impression of the app was that it was fairly intuitive but a bit buggy at times — at least on Android. If you request to watch the live feed, once in about ten times the connection be unable to be established. 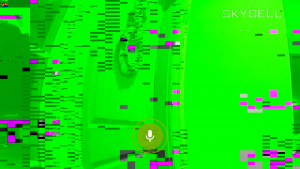 When you minimize the app while in “live video” mode and then come back, the video turns pixelated and a strange green. The notifications on motion and button press however are extremely fast and reliable. We must say though, video is best in class for this device, outperforming any other doorbell we tested. SkyBell also provides a free cloud video recording service which is a valuable addition that you do not find with other brands. SkyBell provides integrations to many third party applications such as Amazon Echo, IFTTT and Samsung SmartThings. Integration into our Samsung SmartThings hub was painless. Inside the SmartThings app you are able to take a snapshots from the camera, control the chimes, and trigger actions when motion is detected. Compared to some of its main competitors such as Ring and August, we found the overall camera quality to be outstanding. 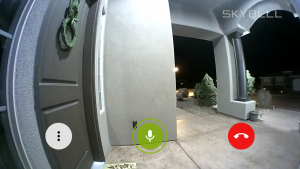 The color night vision was especially impressive; far superior than another smart doorbell and actually quite better than any outdoor camera we have come across. The design of the doorbell also stood out, it’s elegant and much smaller than others. While we did identify a few areas to improve in the app, it still gets the job done and app updates will surely be released to make things even better. If you are looking into buying a smart doorbell whether for convenience or security, the SkyBell HD is a great choice.